A teaser page on the Japanese Xbox site indicates that Japanese landmark Capcom and Microsoft will have something big to announce next Tuesday, January 26th. Quite the mystery indeed: The image you see here to the right showed up on the Japanese Xbox site yesterday, teasing some sort of joint venture between Capcom and Microsoft. 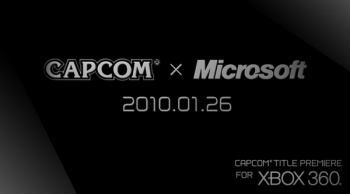 The only information thus far is the words "Capcom Title Premiere for Xbox 360," and the date: January 26th, 2010. Seeing as how they're on the inside, the folks at Capcom Unity Blog know what's up, but naturally they're not telling. Though, judging by the title of the post, the 26th might not bring just one surprise, but "many surprises" from the popular Japanese publisher and the hardware manufacturer. "We can't tell you about all the delicious secrets that will be unveiled at this event, but we can hint that some of the news will be of interest to a global gamer audience," quoth the Unity Blog. And that's... pretty much all we know. So guess what? It's time for wild speculation, kids! Obviously, this will mark the announcement of at least one new Capcom game coming out exclusively for the Xbox 360 - though perhaps only temporarily so, given the trend in the industry. But what could it be? I'm going to hazard a completely baseless guess here: Given that the 26th is the day that Tatsunoko vs. Capcom hits stores here in North America, I predict that the announced game will follow Ryota Niitsumi's statement that there might be a new Versus title in the works. Yes, you heard me right: This new game will be Capcom vs. Microsoft - Ryu and Ken throw down with Master Chief and, uh, Clippy the Paperclip. Okay, probably not. But it could still happen!